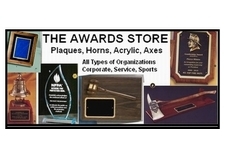 Perpetual plaques are designed so a history of officers, award winners, etc can be maintained. This serves to honor and remember those who helped build the organization. Assorted sizes and shapes available. Prices include engraving of the title plate for the plaque, but not the individual smaller plates. PC572 40 plate Perpetual plaque - Walnut with brass plates 2 1/2" x 7/8" plates - Plaque measures 14" x 20"
PC570A 80 plate Perpetual plaque - Walnut with brass plates 2 1/2" x 7/8" plates - Plaque measures 24" x 18"
PC570B 96 plate Perpetual plaque - Walnut with brass plates 2 1/2" x 7/8" plates - Plaque measures 24" x 18"
PC570C 150 plate Perpetual plaque - Walnut with brass plates 2 1/2" x 7/8" plates - Plaque measures 33" x 24"
PC574 48 plate Perpetual plaque - Walnut with brass plates 2 1/2" x 7/8" plates - Plaque measures 20" x 14"